Worry does not create opportunity; Action is your only way out of worrisome situations. Most, if not all, business problems have solutions; the conundrum is that you may not like the solutions or the outcomes you are forced to consider, but they are there. Problems can de divided into two major groups – ethical and systematic. Ethical problems have the largest of consequences and the least desired solutions; say you are lying on your taxes and an audit by the I.R.S. is in your near future; is this a problem… oh yeah, and a big one. This is not necessarily a business problem and the solutions of restitution or jail will not make you happy no matter what you do – best to hire a lawyer and hope for the best. Systems-driven problems, on the other hand, are either behavioral or due to poor business design, and there is always a solution for such challenges. Your job is to embrace action and get into solving the problem you are facing by talking to the right consultants, and starting to change the behavior of those who cause you the biggest headache. Let's say you do not have enough Real Estate Listings, then it is time to Prospect and encourage your agents to do so; if they choose not to embrace prospecting – it is time to hire new ones. 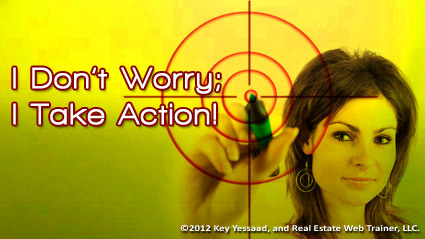 Worrying while in the middle of problems does not elevate your business, it makes you scared of taking action.